Sue died May 22, 1987. Sue and I spent many happy hours laughing, talking and sharing 'girl stuff' while at Redford together. She had straight, tall posture that was very attractive, had a polite and rather proper way of speaking, and always a smile. I didn't have to go to The BLAZER to remember Sue. May God bless those who are missing her. When we were in elementary school, Sue and I spent many happy times playing in her beautiful room. She invited me to go with her to parties in High School and various other activities. Her family was Christian Scientist and she invited me to go with her to her church. It was an enlightening experience. She and her husband came for a visit to our home in West Bloomfield and we had a nice time. We exchanged cards at Christmas. They had a farm. She was a lovely person. Sue,Patty Mckee ,and I used to have Lunch with Soupy Sales at noon during our lunch break in the 7th Grade. 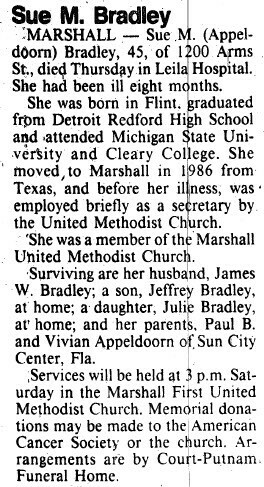 Sue was a good friend of many classmates, especially my dear friend John Fletcher. The Appeldoorns had a 1953 or 1954 Blue Chevrolet Convertible. During one gathering of friends Sue's parents carefully checked my drivers license to see that I was OK to chauffeur their Chevy full of kids on a drive out Grand River west of Detroit. John Fletcher kept in touch with Sue's parents many years after Sue passed away. Sue and I met in a 10th grade biology class. She was very special with a great smile and warm personality. Sue wore braces until her 16th birthday (smile got bigger). She helped create memories for us which still endure. I often talked with Sue's father Paul (aka PB) and mother Vivian over 30 years until their passing in 2005 and 2007 in Florida. Sue was an only child missed by all. Sue was a Burt School classmate and in my Girl Scout troop, lived on Bentler across from Pat McKee......hard to believe they both are not with us. I remember several parties at Sue's house particularly the slumber parties (of course we didn't sleep). Sue was a sweet,warm person with a bright smile even with her braces. I had heard several years ago that she lived in Northern California on a farm for a time but not sure if that is true. She was a classy gal and along with Pat will be in our hearts. Sue was a classmate at Burt Elementary. She had the prettiest smile and disposition. I remember riding my bicycle over to her house. It was a long way to go because I lived on Plainview on the oppisite side of the school area from her. We both wore braces on our teeth and there were not many who did. Her mother was so sweet to me. I'm glad I had her for a friend. I remember Sue, and her lovely parents, especialloy from our Burt School days. In fact, my mother, who is 91,said to me recently, "what about Sue Appledoorn?" So she is remembered and missed!